We supply both genuine (OE) and where available, Aftermarket parts. An Aftermarket part will have a P (pattern) suffix at the end of the MG Rover part no. Other suffixes such as UR (uprated) and SS (stainless steel) are also used to denote other variations of the same part. These are shown as options below the originating part no. See Parts Information for further details. 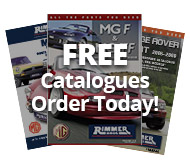 Also refer to MG Rover Close Call for details on special pricing that may be available, to help keep as many MG Rover vehicles on the road as possible, with affordable parts.